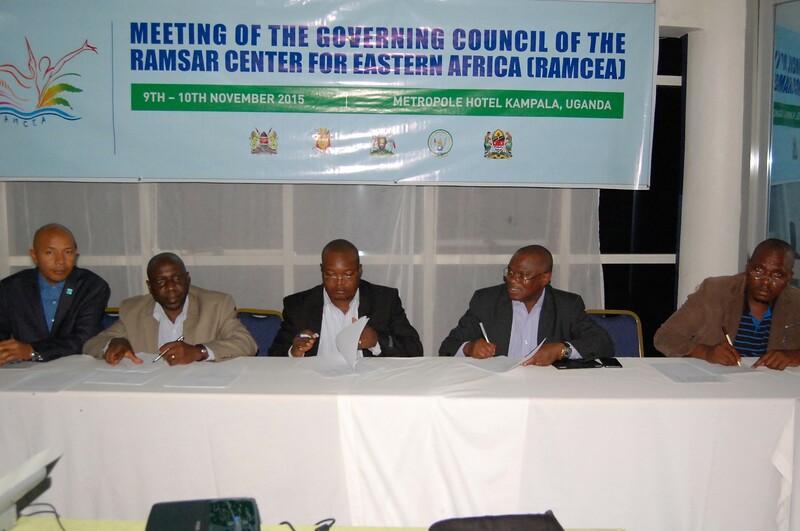 The Heads of Administrative Authorities from the Republic of Burundi, the Republic of Kenya, the United Republic of Tanzania and the Republic of Uganda came together on the 9th and 10th of November 2015 to participate in the first meeting of the Governing Council of the Ramsar Centre for Eastern Africa (RAMCEA), held in Kampala, Uganda. 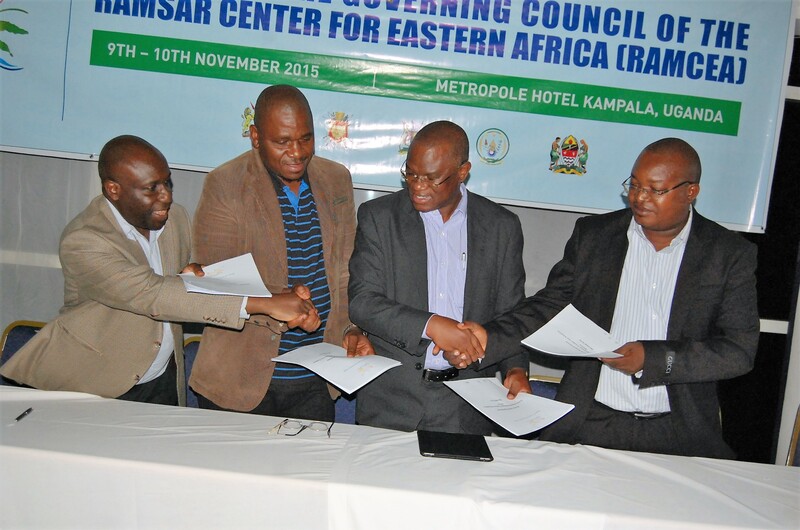 They were joined by representatives of the International Union for the Conservation of Nature, Birdlife International and Wetlands International, all International Organisation Partners of Ramsar operating in the Eastern African region. They were also joined by officials from Uganda’s ministries of Justice and Constitutional Affairs, Foreign Affairs and Water and Environment. The meeting marked an important milestone in the further development of RAMCEA, a regional initiative developed with the support and guidance of the Ramsar Convention and to be implemented under the authority of the Convention. 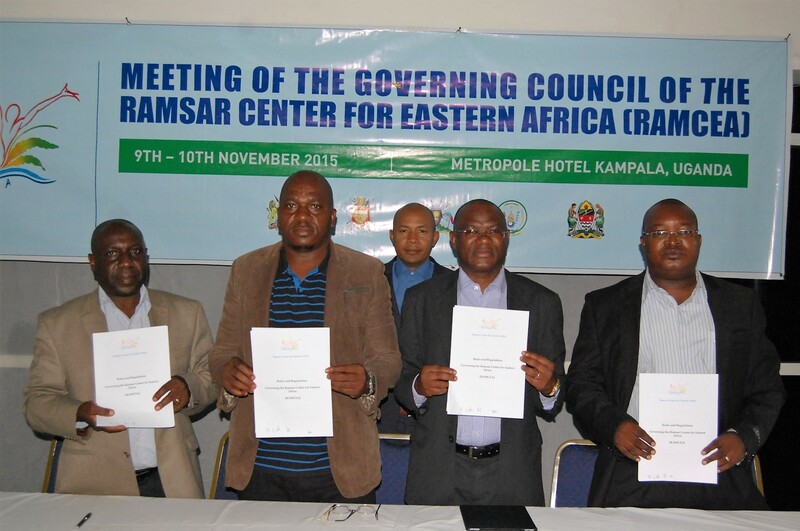 RAMCEA was established by its regional partners to build capacity and excellence in wetland management in East Africa. The Governing Council meeting was organized by the RAMCEA Secretariat, working with the support of Uganda’s Ministry of Water and Environment. 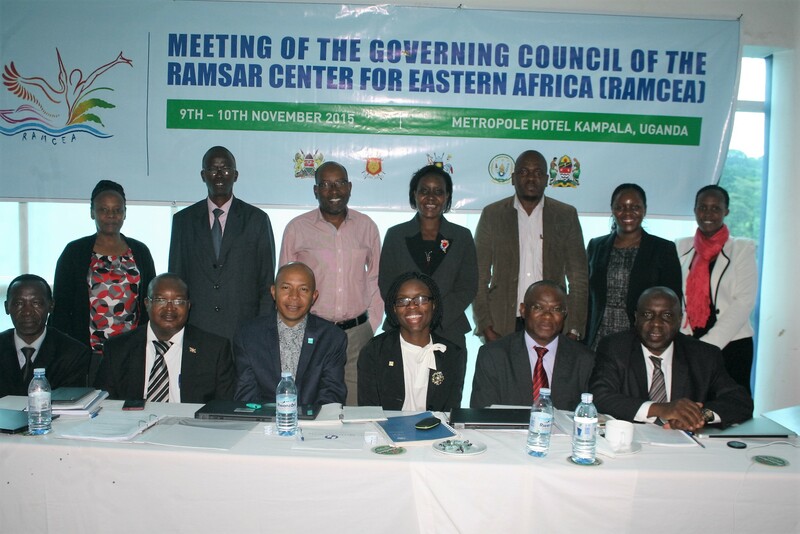 Uganda has agreed to host the RAMCEA Secretariat and has provided an office where the soon to be recruited Chief Executive Officer will begin the work laid out for RAMCEA. The members of the Governing Council took time out from their discussions to visit the new office and expressed their gratitude to the Government of Uganda for making it available. Though much remains to be done, the Governing Council took an important step during the meeting. The Rules and Regulations that will govern the operations of RAMCEA and its Secretariat were reviewed in detail, revised and finally approved, adopted and signed. The Governing Council approved the organizational structure and also endorsed the RAMCEA Strategic Framework and approved the 2016 work plan and priorities for the next two to three years. The Governing Council were to be found working late into the night on the last day of the meeting to ensure they finalized and signed the Rules and Regulations before heading home the next morning. There were smiles all around and a round of applause as they achieved their objective and sat down to sign into life the Rules and Regulations that will be central to RAMCEA’s future. The signing was witnessed by the Ramsar Regional Officer for Africa, Mr. Rasamoelina Rakotomamonjy who attended throughout the meeting giving invaluable guidance and advice to the Governing Council. The steady progress of RAMCEA through the many complex formal requirements of establishing a regional institution under the terms of an international convention are testament to the hard work of the Secretariat and, especially, the commitment, wisdom and foresight of Mr Paul Mafabi, the Director of Environmental Affairs in Uganda and a life-long advocate and staunch defender of wetlands in Uganda and around the world. Visibly satisfied with the work of RAMCEA, the Senior Advisor for Africa at the Ramsar Secretariat, Paul Ouedraogo said “RAMCEA has such a significant contribution to implement the Ramsar Convention in Eastern Africa. An African proverb says that if you have only one tooth, then it must be clean and white. RAMCEA is the only operational center then we must all support and contribute to RAMCEA. I would like to say thanks to all the Head of AA and National Focal Points of RAMCEA country members for their commitment. I especially appreciated that RAMCEA always go the extra mile just to accomplish everything before the deadline. The way RAMCEA motivate its partners to give their best is also very remarkable. RAMCEA truly lead by example”.